We tried our hand at grilling bone-in pork chops last weekend. I found a version of this recipe on Pinterest and traced the original back to Patio Daddio BBQ. I made a few changes to suit our tastes, and they turned out great! 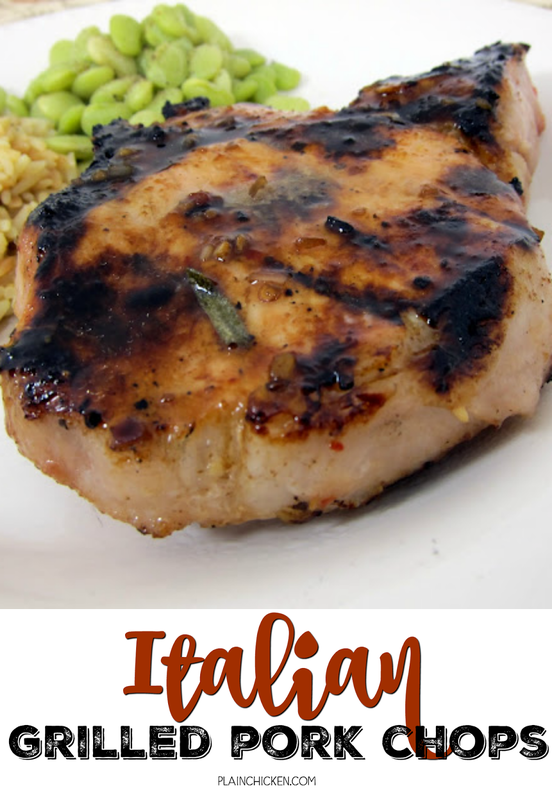 The pork chops are marinated in Italian dressing and basted with an Italian balsamic sauce. We both loved all the flavors in the pork. I let the pork chops hang out in the marinade all day while I was at work, and we threw them on the grill when I got home. They couldn't have been easier! Put the pork chops in a gallon-size zip-top bag, and pour 1 cup of the Italian dressing over the chops. Refrigerate for 4-6 hours. In a medium sauce pan, whisk together 1 cup Italian dressing, balsamic dressing, Worcestershire, honey, rosemary and pepper. Bring to a boil. Reduce heat and let simmer for 5 minutes. Grill the pork chops until done, approximately 6-8 minutes per side (depending on thickness), brushing with basting sauce while cooking. I'm flattered that you tried the recipe and I'm very glad that you enjoyed it. These sound delicious and I have tons of fresh rosemary right now! This sounds like a great dish for the grill this weekend. You should bring this over to What'd You Do This Weekend? It goes live at midnight Sunday. Could you do this on a counter-top grill? Our outdoor grill died last year and we have yet to replace it, and I'd love to do these SOON! If "yes", what temp would you suggest, and should I leave the lid open and turn them, or cook closed-lid? John is a fantastic cook and a great guy. Have had the pleasure of hanging out with him at a few Kingsford events. Try his slammin salmon glaze sometime, good stuff! Do you use boneless or bone-in chops - I never seem to make pork chops because I don't know what to do with them (but I'd like to try this!). Thanks. Starsky99 - I used bone-in pork chops for this recipe. The other pork chop recipes on the blog use boneless pork chops. I think the boneless pork chops are easier to cook - they also take less time. Wow these were incredible. We don't have a grill (sad fact for a Texas girl...) but we broiled them 10 minutes per side and they were probably the best pork chops we've ever had!